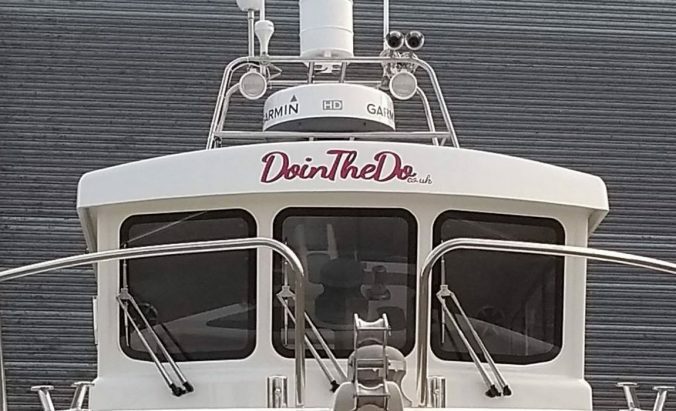 See entries for the DoingTheDo Photo Competition! Here are some of the entries for the DoinTheDo photo competition received so far. 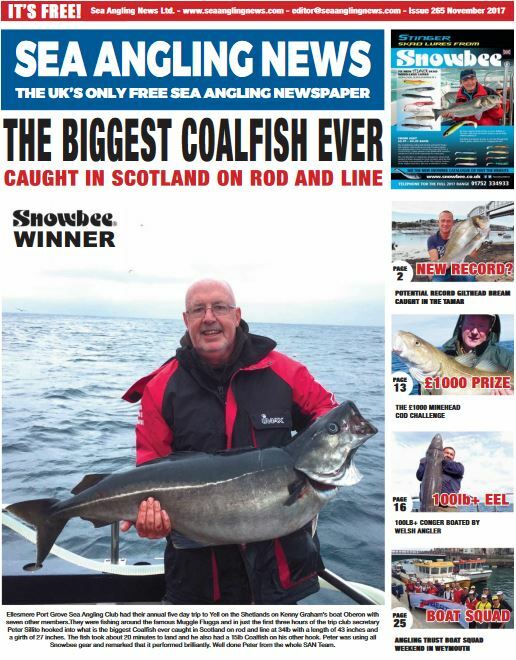 There is still time to send in your entries to news@boat-angling.co.uk. Entries close 30th June 2018. First Prize a day on DoingTheDo charter boat with Dave and Caroline; runner-up prizes of bags of DoinTheDo swag! Well what a dismal few weeks we have had! The wind has kept most boats off the water for a number of weekends since the last report. Those that did get out in gaps in the weather found mainly dogfish, whiting and conger. After a promising appearance in late October and early November, the cod have gone into hiding. The conger that are roaming the usual marks can be quite a nuisance, or exciting, depending on your point of view. Their behaviour changes significantly in the autumn, and instead of hiding in wrecks and rocks as they do in summer, they are now roaming in daylight, attacking large baits with gusto. They are even biting hooked fish on the way to the surface. 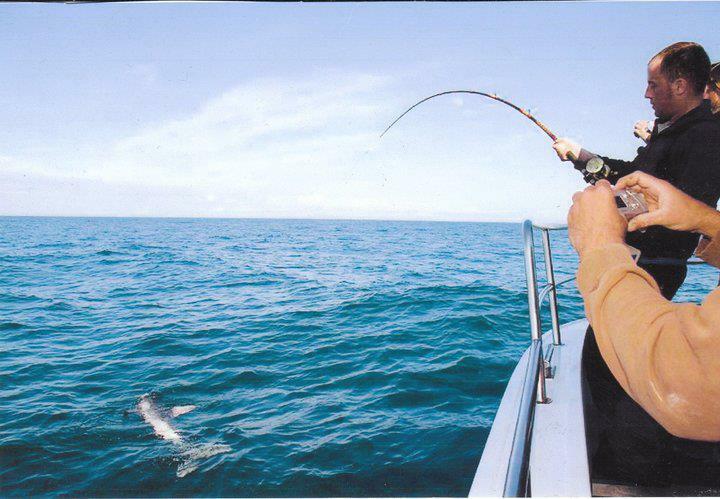 If you want action they will give you that – picking up a bait and running with it like a tope. If you want cod, then an expensive cuttlefish bait being snaffled by a conger within minutes is beyond annoying. So instead of recent catch reports, we thought we would look back at some of the activity in the area this year. The Southsea Marina Angling Club (SMAC) runs monthly and seasonal competitions, and raises money and donations for local rescue charities. We support the independent Gosport and Fareham Inshore Rescue Services (GAFIRS) and the RNLI which has a base on our doorstep. We had a visit from the local crew at a club meeting to receive their donation – see photo. We would certainly feel safe in their hands! Specimen fish recorded through the year by SMAC were Kevin Johnson, Bass 10lb 1oz; Steve Andrews, Bass 11lb 4oz; Tony Harris, Bass 11lb; Kris Scott, Bass 11lb 3oz; Tim Andrews, Pollack 16lb 3oz. In the Catch and Release Specimen Fish category for 2017 were Neil Glazier, Undulate Ray 15lb; Jocky Park, Thornback Ray 15lb; Heber Crawford, Undulate Ray 22lb 4oz; Bill Arnold, Thick Lipped Mullet, 5lb; Jake Kelly (Junior), Undulate Ray 14lb and Martina Houghton, Undulate Ray, 14lb 6oz. Pat Dorking recorded a John Dory of 3lb – not huge but certainly unusual for this area. We had the very welcome news from Dave Stenson that his wife and fishing partner Caroline has been given the all-clear after a long battle with cancer, and will be back featuring in our catch reports again very soon. She usually out-fishes everyone on the boat. She even went fishing during a gap in her treatment – such resilience. An amazing lady, great to have you back on the water Caroline. If time is short or the weather is uncertain, LRF tactics can be used from boats and structures around the harbours with great success. Admittedly, catches won’t feed a family but if you fancy some sport on much scaled-down tackle, you will find inshore waters teeming with fish and a wrasse of a only a couple of pounds can give you some serious trouble on very light gear. Due to the weather it is likely that the SMAC Open Cod Competition will be carried over into January, either 7th,14th,21st or 28th, with a 1st prize of £500, 2nd prize of £200, plus a good prize table. There is always the chance that cod will reappear, and then we have next year to look forward to with the spring run of plaice followed by bream, smoothhound and tope. Looking forward to the warmer weather already. A catch report from Heber Crawford today (28th December). I decided to give the cod fishing a miss today and fished some offshore sandbanks instead and was rewarded with a few bass to around the 3lb to 5lb range, two small-eyed rays to around 7lb, a nice undulate ray well into double figures but to top it off had a lovely 6lb 4oz turbot weighed on the club scales back at the marina and a new club record. Absolutely chuffed to bits, a beautiful day and a great way to end the year I think. All fish returned apart from the turbot. All fish caught on frozen mackerel that I caught myself in the summer . I was out with Richard yesterday, 22nd Dec, on his boat “Wicked Tuna” from Southsea Marina. We fished a mark North East of the northern end of the Nab Dredged Channel. After the rough weather of recent weeks, it was great to get out in light winds and a smooth sea. We fished a mix of rigs, some with large squid baits for Cod, and others lighter outfits to target Whiting. Fishing was slow over the end of the flood, with a few Whiting and Pout. We hoped the fishing would pick up with the ebb, but apart from dogs being added to the species caught, fishing remained slow. Just as we were considering a move, Richard had a very heavy take, but failed to hook-up with the fish, which we assumed was either a Cod, or a Conger, so we decided to stay. I then had a strong take on my light rod rigged with a two hook paternoster baited with small strips of mackerel for Whiting. On picking up the rod, the fish took off on a very strong run that was difficult to stop. I slowly gained control of the fish even though it continued to make several strong runs, but eventually I guided a cracking Pollack into the landing net. It weighed 13.11lbs on my digital scales. We stayed on the mark for another couple of hours before returning to the marina, and a beer in the marina bar. Whilst our main target was Cod, that Pollack made my day. Connor on 19th December…a common story actually. It was a very cold, icy morning and the night had been very calm so we expected fog, also because it was on the forecasts. Luckily when we came out past West Pole it was a lovely – the sea was flat and although it wasn’t perfect there was a few miles of visibility. We started off south of the Nab on the flood where I failed to connect the best bite of the day, most likely a conger or ray but could of been that elusive cod which is sad to think about. A few other bites resulted in dogs. At slack we moved to Culver with a few other boats already there, for the ebb flow. A few small rattles, most likely whiting, early on in the ebb were also missed and we headed in earlier than we had planned as we were getting cold. Unfortunately the dogs we did have came to my dad’s rods so that’s a blank for me! Oh well, was a lovely day to be out on the water, next time we’ll be after rays as it seems like this is one of those years on the cod fishing. 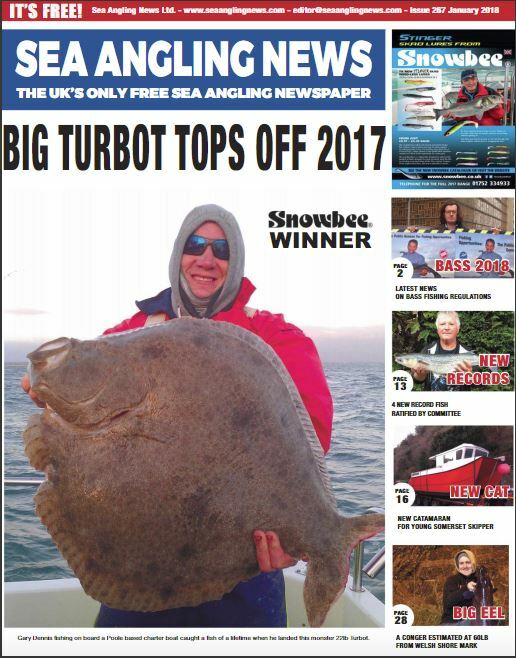 Our report made the front page this month with Kevin Osman’s magnificent cod! You can access the on-line edition of SAN here. We are now well into the winter season with plenty of whiting being caught, but not as many cod as we were hoping for. 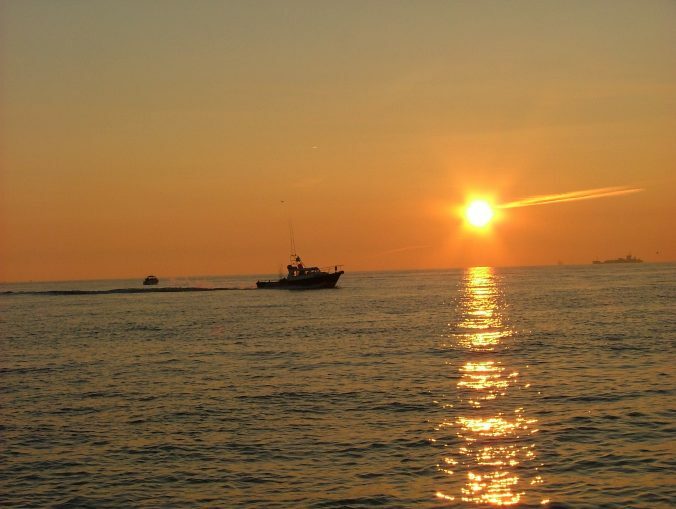 The cod season started with a flurry of catches a few weeks ago then we had a bit of a lull. As a result, a few of our local photographers had to share photos of sunsets instead of cod! Now a few more are being landed. Not in the numbers we caught many years ago, but better than some recent years. We have noticed some changes in fish migration – the scad have stayed around right into November this year. Trigger fish arrived, hung around for a few weeks and went again. There are plenty of bass being caught, although we have to observe the take-home limit of one fish over 42cm per angler per day, catch and release after that. There are large shoals of school bass moving around the Solent and approaches. They are easily spotted under flocks of very excited seabirds! 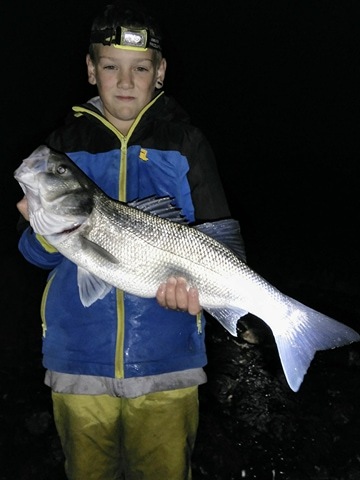 Some larger bass have been caught further out – see photos. 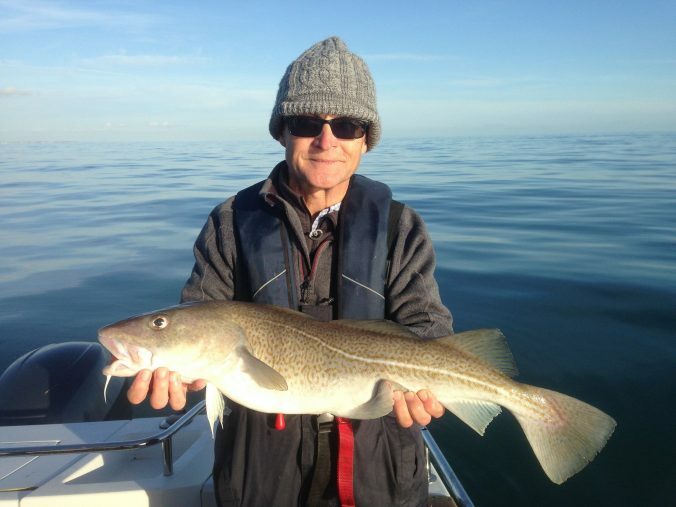 On to catch news: catch highlight of the month was by Kevin Osman, a member of the Southsea Sea Angling Club, who fished an area around the Nab Tower. Using a mixture of dead and live baits, he managed to land this amazing 34lb 8oz Cod. 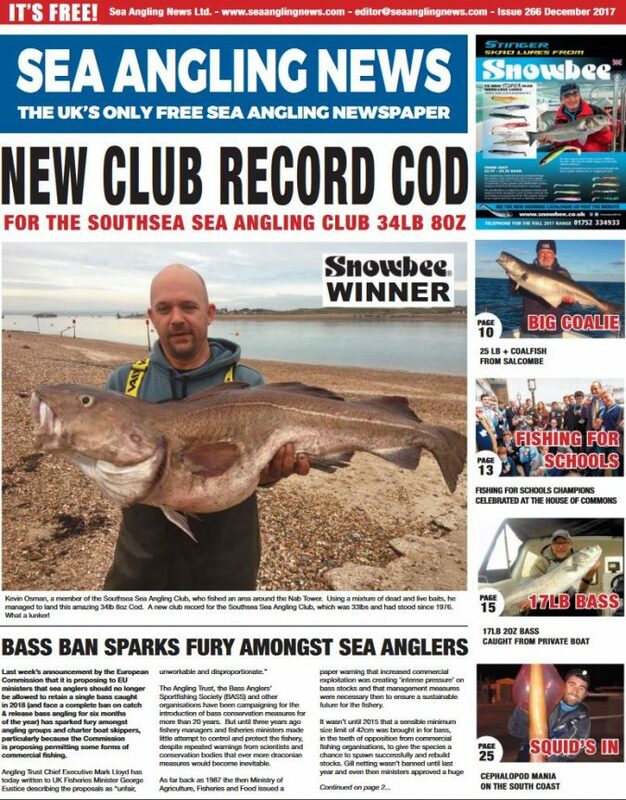 A new club record for the Southsea Sea Angling Club, which was 33lbs and had stood since 1976. What a lunker! Archie Crawford showed his dad how to fish by landing this very nice bass of exactly 8lb, caught with a whiting livebait. Archie is also in the lead for the SMAC Junior Species competition with 28 species this year so far. 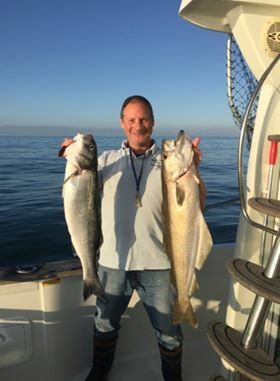 Tim Andrews fished from his boat Double Trouble out of Southsea Marina, drifting offshore reefs and banks with artificial lures, catching 12 bass to 9lb and 6 pollack biggest 12lb. He also had cuttlefish and even a smoothhound on lures! Southsea Mariana also has a Disabled Angling Club. 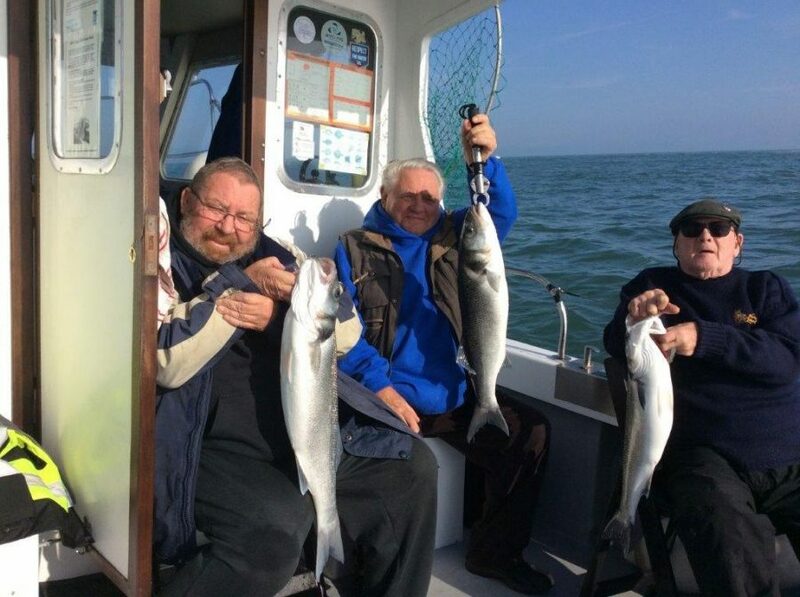 Here are (left to right) Jon Leythorne, John Wearn and George Dominy, bass fishing from the private boat Lady Elsa skippered by Steve Kelly. Steve also brought in a cod of 17lb 1oz. Other fish of note from the Southsea Marina Angling Club books are two bonus turbot caught while cod fishing. Jocky Park had one at 4lb 3oz, and Kris Scott followed up with one of 3lb 13oz. Martina Houghton caught a nice Undulate Ray of 14lb 6 oz (catch and release) and Bill Arnold landed a mullet of 5lb (also catch and release). Friday 3 Nov was a beautiful day, the sea was flat the fog had cleared and we skimmed from Stokes Bay to the Fingers in “High Hopes” in search of something large; cod, conger, bass? Fishing before 9.30 we were straight into whiting with the occasional dog, by 10.30 the bites had virtually stopped but the sun was shining. The tide turned and we fished on slowly for another hour and then re-anchored about half a mile to the South on another bank. Again fishing was very slow, a few whiting and several dogs, then a thornback and a gurnard. The radio was indicating it was the same all over, surely on what was a perfect day there would be something to write home about. It was turning out to be a lovely day with some very disappointing fishing. Then about 3 pm as the tide was grinding to a halt, a knock followed by the rod surging down (and out) and battle commenced. Well behind the boat the fish surfaced, dived and then surfaced again to the side of the boat. It was shy of the net but once in the boat came in a shade under 12lb, my first double figure bass. We fished for a while longer but that was it, what a difference a bite can make. Gordon and I went out on the 30th . The weather was fantastic although there was not much of a tide. 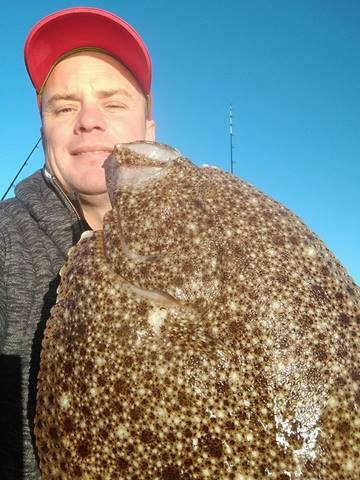 We headed out to the Nab area , and had a couple of thornbacks up to 11lbs, a bass of 3lb, and the first cod in the boat this season which weighed 7lb 12 ozs. Plenty of doggies as well , but only one whiting. 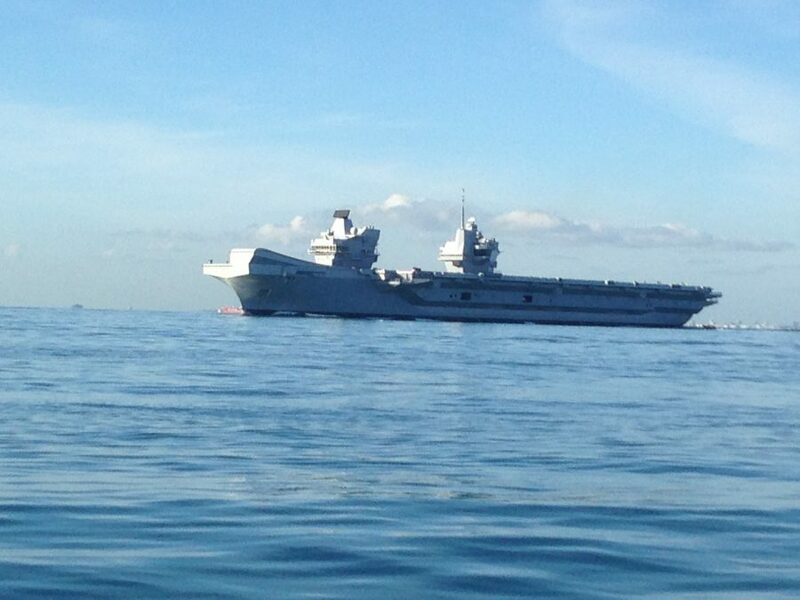 We were also really lucky to see the new aircraft carrier at close quarters as it came out of Portsmouth for the day – together with a circling helicopter and police ribs! So armed with a box of squid and some frozen mackerel we headed out to a hole a couple of miles south-east of the Nab. With a lot of the charter skippers seeming to be East Nab we questioned our thoughts. Did they know something we didn’t ? Well, obviously yes – they are the professionals after all. But hey ho – out we went to the deeper water, 100ft in the hole, was hopefully our saviour. The first hour produced a few dogs, a couple of whiting and a 10lb smoothie caught uptide at the top of the hole, not in it. 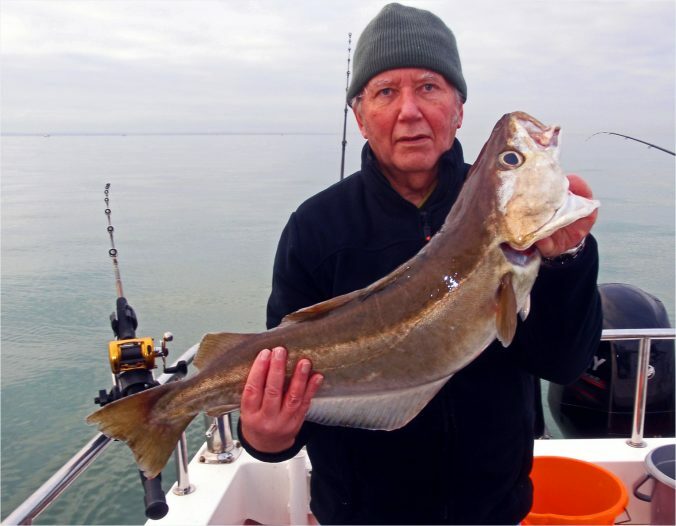 Then a strap conger – and it was small – couple of pounds at most and a 5lb Thornie. Still nothing to write home about. As the flood tide picked up the fishing got better. A couple of bigger Thornies getting close to double figures and a few bigger straps. Also up towards the 10lb mark. In between the odd pouting, I suddenly had the feel of the Nod. Having had a few conger, which although not large gave great sport on 12-20lb rods, I did get a shock when it hit the surface. 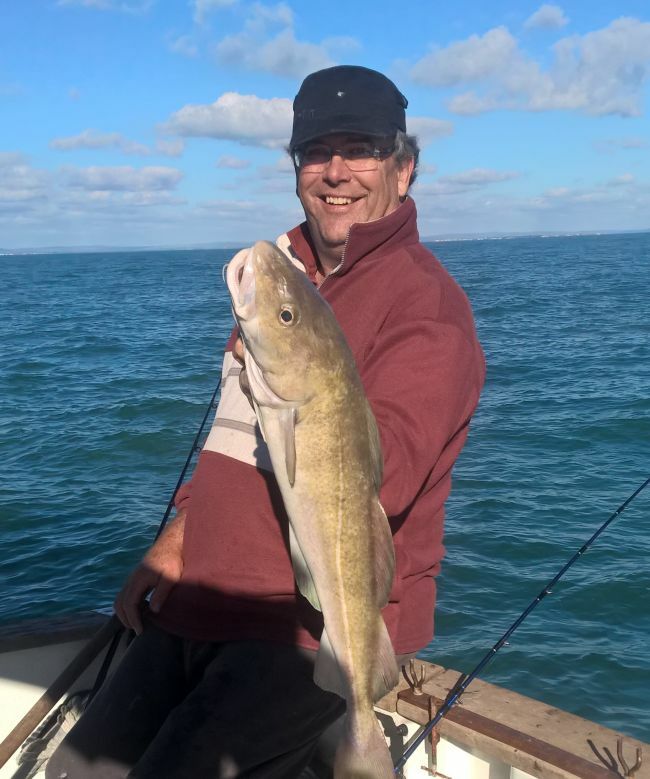 Up came a codling – yes – first of the season for us. Not double figures, but enough for a fresh fish tea and some to freeze. Unfortunately for me Roland took the largest fish prize with a 20lb+ conger, released at the boat side so only an estimate. Still way bigger than my cod or thornie so he won the pint for the largest fish and wiped out my first fish pint. I now owe him 7 pints for the year – not a good year. All in all, we had about a dozen conger, 3 thornies, 10 whiting, a smoothhound, and quite a few dogs and pout – oh and the cod. The bigger fish all took whole squid (not convinced on the boilies as I read earlier) and a lot of the whiting on mackerel strip on a flyer. If we tried mackerel on the bottom – we got dogs. Something to note. Still all in all, not bad for two of us. October in the eastern Solent area is often a cross-over month between the summer species and the arrival of winter cod and whiting. This year the summer species have stayed around well into the month with good catches of plaice, some bream plus garfish and scad still taking baits or feathers off the bottom. Conger are roaming the rough ground away from their summer haunts of wrecks and rocks, and can provide energetic sport or be a nuisance to those targeting cod, depending on your point of view. A good autumn conger on open ground can run like a tope and put up a very good fight. 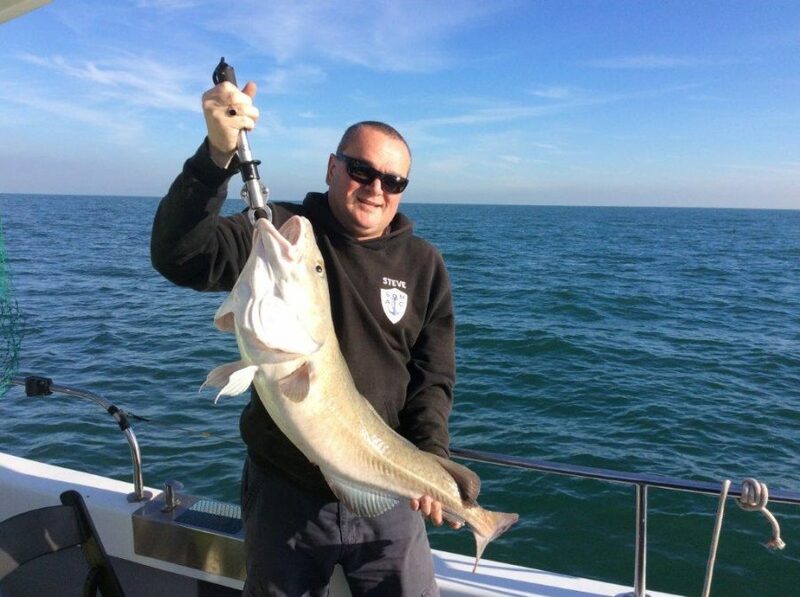 On the subject of cod, we have seen a limited run of autumn fish with the luckier boats having four or five to about 15lbs, mainly reported from Solent marks. The first few whiting have appeared but not in the numbers we expect later. We usually see a few trigger fish on the rocky marks at this time of year, and some nice fish have been caught this month. Bass fishing has been excellent with the inshore shoal fish being larger each year and giving good sport on light spinning tackle. The bigger fish tend to be hanging well below the smaller fish which will often grab a lure on the surface. Further offshore there have been good catches of bass to 6lb on the better days, although only one fish of over 42cm per angler per day can be retained. On 8th October the interclub boat competition between Southsea Marina, Langstone Harbour, Eastney and Southsea Sea Angling Clubs was held with 39 individuals entering on their own boats or from charters. The competition for best specimen fish was won by Ray Plomer fishing from his own boat Ruthless with an undulate ray of 13lb 15oz. Catches were generally disappointing on the day but Mark Banks brought back a bull huss of 11lbs and Tim Andrews a ling of around 20lb. Heber Crawford started late and stayed in the harbour, but nevertheless winkled out several very nice wrasse the largest 4lb 1oz. 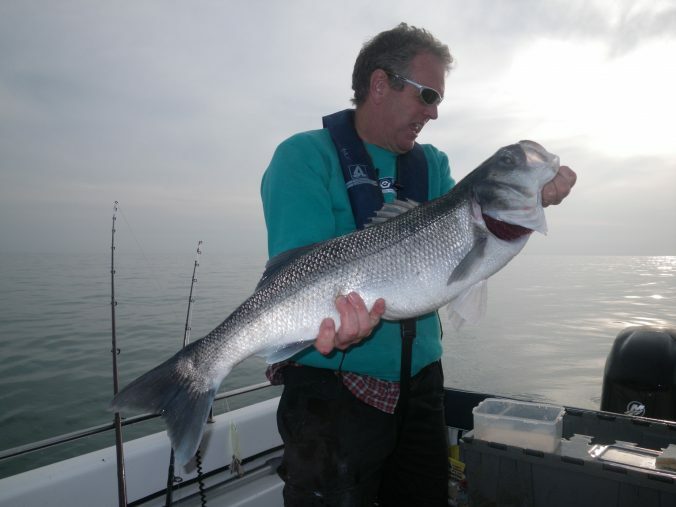 Notable fish reported this month included a monster bass of 16lb 4oz caught by Les Chant from a Langstone charter boat. Bait was apparently carp boilies. This has aroused much interest from other anglers as this might be an alternative to the very high prices being charged for our staple cod bait, frozen squid! Pete Kilshaw of the ECA caught a twaite shad of 1lb 8oz which was quickly released because these are protected species. Mark Argyle also of ECA caught a nice bass of 9lb. 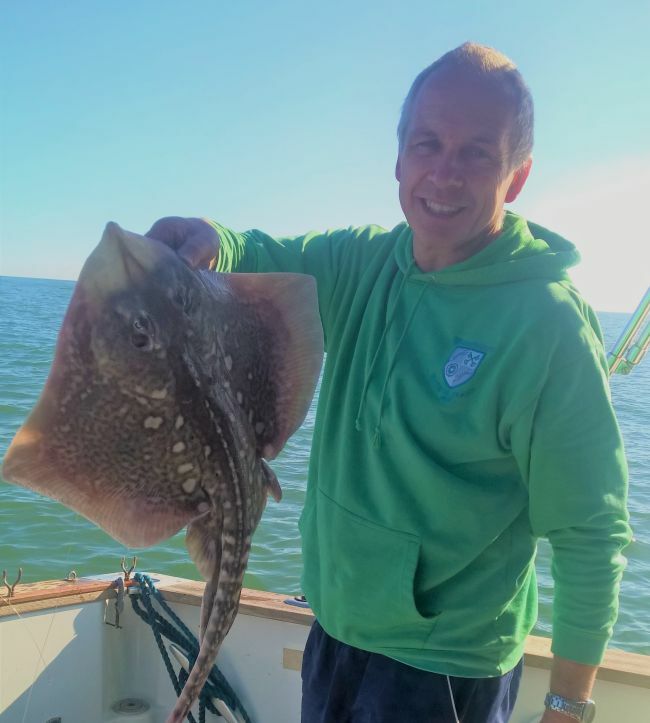 Catches from Southsea Marina Angling Club included a trigger fish of 2lb 1oz caught by Tony Skinner and in the junior section, an undulate ray of 14lb to Jake Kelly (pictured). Heber Crawford is way in the lead in the species competition, with 52 to date. The next competition will be the Southsea Marina Angling Club Open Cod Competition scheduled for 3rd December, with reserve dates of 10th and 17th December if the weather is unfavourable. First prize for the largest cod is £500 plus a prize table. Entry is £10 – for further details contact Steve Kelly at Southsea Marina on 02392 822719.